A big part of our travel strategy is to take advantage of great fares on weekends while taking minimal vacation time off. Although we can’t capitalize on every deal, we want to highlight great deals for others as well. 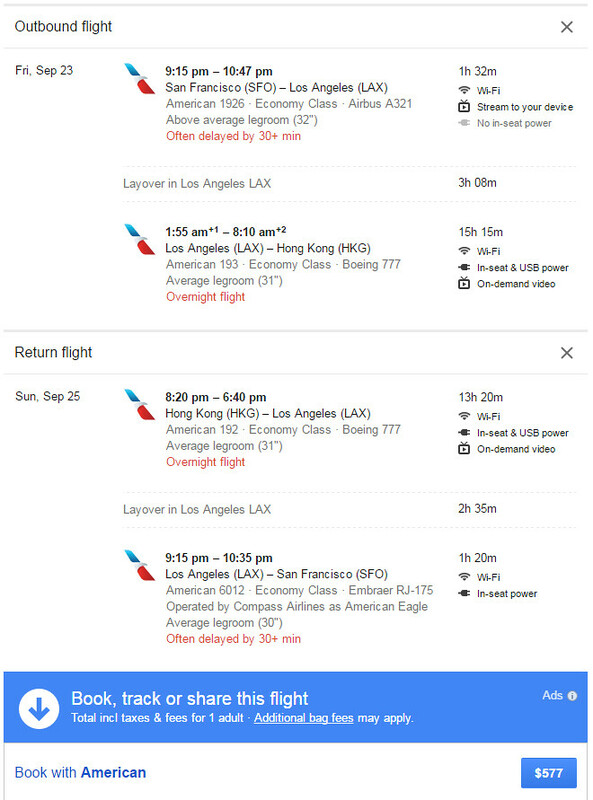 In fact, if you are needing qualifying miles or just looking for a fun weekend trip in September, we’d highly recommend you jump on this $500-600 deal to Hong Kong (we’ll break out the math later in the post). In fact, if you think you might go you should just book the flight. All US airlines have 24-hour cancellation policies so you can always change your mind later tonight (but the flights might not be there later). For our international weekend trips we typically look for places that are 10-13 hours away. If you think about a weekend which has 48 hours, factoring in travel time that conveniently leaves you ~ 1 full day in an international location. If work is flexible enough for you to take a Friday off (especially in the summer months), even better since that leaves you with 2 full days instead. Furthermore, Hong Kong (13 hours away) is a really great candidate for a weekend visit. When most people talk about Hong Kong, the two things that stand out the most are the great food and the amazing nightlife. 1-2 days gives you the perfect amount of time to hit your top food spots and spend a night in LKF. It doesn’t take a travel blogger to realize that <$600 to Asia is a great deal. But what makes this flight really unique is that all the flights on sale are on domestic metal i.e. United/American/Delta. Unfortunately for travel hackers, a major trend of the last 24 months is the lowering of partner earning rates (especially that of Asian airlines which most frequently discount flights). Whereas previously most partner airlines earned full miles now it’s rare to find any partner airlines that earn full miles on discount economy which is the bread and butter of the long haul miles game. As you’ll see below, this flight prices in the 3-4 cents per mile (CPM) range depending on your airline and your interest in mileage running. Besides being a catchy name, a Friday night departure is really key. Most Friday night flights depart between 4-10pm, which means that you can gain 12 additional hours vs. a Saturday morning departure. When you’re only there for 24 hours sometimes, that could be a 50% increase in the time you’re at a location (with no additional hotel costs!). Now on to the actual deal itself. 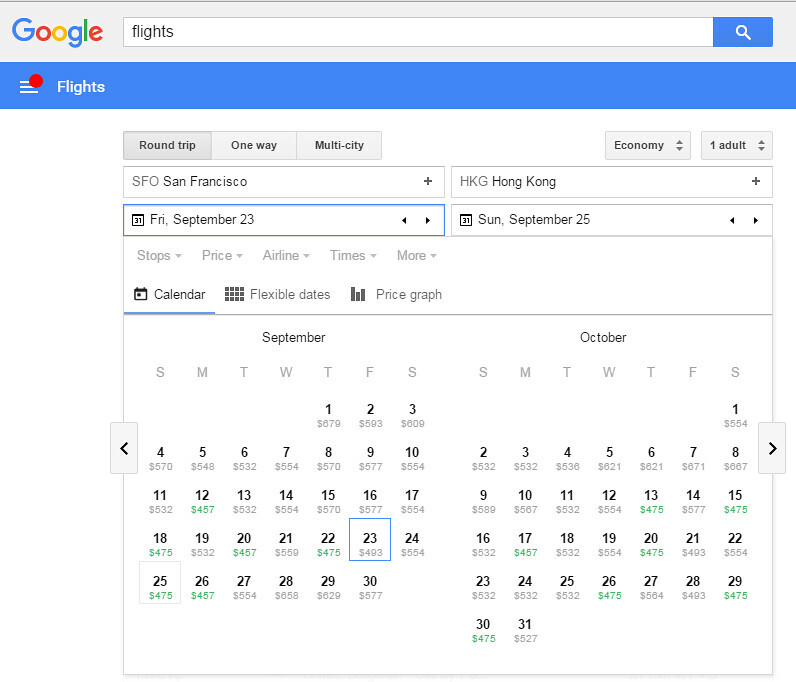 Google Flights has a terrific interface for looking at dates at a glance and you can quickly see that there’s tons of availability across September and October (LKF for Halloween anyone??). 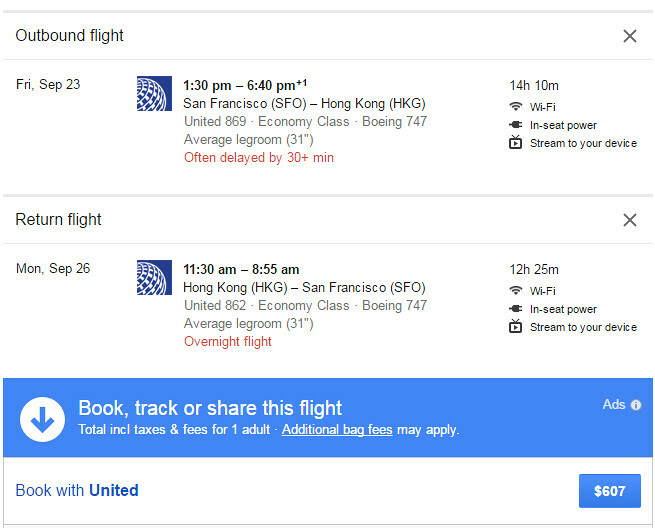 If you’re a normal person in San Francisco, you probably fly United which is great since there’s a nonstop to HKG on United on sale. Unfortunately, you have to take a half day off on Friday, but you get a full 40 hours in Hong Kong. Additionally, this flight earns 13,854 qualifying miles which is just over 4 cents per mile (!) and would get you halfway to the next tier (aka Silver if you had not flown a single United flight this year). Most flyers we know have the United credit card so the spend requirement is waived. On the other hand, if you are a masochist (like us) and fly AA, here’s your best option. A little cheaper but with a layover in LAX and much less time in HKG. We would only do this flight if we sorely needed the miles (15,520 qualifying miles which gets you 60% of the way to Gold status) since you’d only get 12 hours on the ground. This flight is 3.7 cpm (an amazing deal for a weekend trip).